I’m going to share a few tips I learned. I know I was tired of having to look at 20 sites for basic info and never finding what info I needed. So, I’ve tried to compile some basic info below in the hope it helps centralize efforts. Always seek advice from a qualified, competent medical professional for any health related issues. I’m not a doctor. I can only describe what issues apply to me, my family or friends. The most important pieces of info to remember: A 30 minute walk each day will help your body to produce required insulin levels. Vinegar on any food will break down sugars. Belly fat impairs your body’s ability to produce insulin. Sugar in your blood is like crushed glass and will destroy your kidneys, organs, blood vessels and damages blood cells causing blood clots, loss of hands or feet, loss of kidneys, blindness, amputations. Don’t eat any white foods or starches. (white bread, potatoes, sugar, white rice, etc. ), never eat any kind of corn, your brain requires some carbohydrates to function. To my best knowledge, blood glucose should be between 75-100. 70 is too low and you can die from going without any glucose. I believe the #1 cause of diabetes is Corn and corn products such as corn syrup, corn starch, corn oil, etc. in nearly everything you eat or drink. This doesn’t mean there are not other triggers to cause diabetes but Corn is certainly one of them. Start reading the ingredients on everything you eat. If it says corn, don’t eat or drink it. Cook from scratch instead of processed foods so you know exactly what is in it. The ethnic groups and countries with the highest levels of diabetes also have the highest levels of Corn in their diets such as Native American and Mexico and US. The lowest levels are Asian countries such as Japan and China. I would also recommend avoiding soy and yeast as well for other reasons. Take a look at the following list and you will see how the ethnic groups with the highest corn levels also have the highest diabetes levels. Avoid white breads, potatoes, sugars, white rice, corn, corn syrup, corn starch (any kind of corn), sweets, desserts, pasta, animal fats, fatty beef, greasy fatty meats, snacks, chips, fast foods, soda pop, no fried foods, processed foods, milk fat (drink skim), cheese, canned fruits, jellies, ketchup (Catsup), mayonnaise, syrup, (I recommend avoiding soy for other reasons), cakes (any white flour breads), alcoholic drinks, etc. Vinegar will help break down the sugar when added to any foods. Change to Wheat bread, wheat pasta, wheat products, truvia, skim milk, plain cheerios cereal, lean meats, seafood, (cooking by steam, boiling, microwave or baking. No frying!) baked turkey, baked chicken (no poultry skin), olive oil, salads (Vinegar & olive oil dressing), brown or wild rice, vegetables, cook from scratch, skim milk, yoghurt, vinegar, mustard, eggs, Amy’s brand soups, cook veggies from scratch, veggie stews, steamed cabbage, cabbage stews, white summer squash instead of potatoes, etc. Here is an article about food for diabetics and foods to lower your glucose levels to avoid getting diabetes. The symptoms I had for high blood glucose was headaches, fatigue, chronic thirst, frequent urination and blurry vision (could also be Sjogrens). Other symptoms listed are tingling and numbness in hands and feet (could also be Raynauds), slow healing injuries and bruises (could also be lack of vitamin C). Not one of my eye doctors ever suggested I should check my glucose levels when I complained of blurry vision. I had to buy my own test meter to check myself. Unfortunately, I did not know when to test or what I should be looking for. If your blood sugar levels are above 150 two hours following a meal, your insulin is not adequately taking care of your needs. Start checking your blood 2 hours after every meal and report these findings to your doctor who can advise any treatments you may need. Here is an article on Diabetes symptoms. It is critical to have CLEAN hands and a CLEAN test area on your skin before testing your blood. The monitors are so sensitive to blood glucose that any contaminants can artificially elevate the glucose readings on your monitor. For example, I was eating some grapes while on my computer and watching TV. I managed to transfer some of the grape juices to my keyboard, mouse and TV controller. Days later, even though my hands were clean, I picked up the remote after I washed my hands and it transferred grape glucose from days earlier, to my fingers. I was getting three wildly different readings on the same test area. 249, 365, 289 all within 30 seconds due to the contamination. If I had taken the insulin based on any of those readings, it would have dropped my glucose to fatal levels. My true reading was 149. Fortunately, I recognized those higher readings were not normal for me. I thought I had bad test strips. I asked the pharmacist, a nurse I knew who has a son with juvenile diabetes and none of them had heard of 3 different readings like this in a row. I even tried double checking between different fingers and different hands. This went on for over a week or two before I finally figured out what was wrong. Just because you do not see or feel sugar on your keyboard or remote, etc., it doesn’t mean you are not getting cross contamination. Lotions may also alter your glucose readings as may some soaps. An alcohol wipe may not remove the sugar contaminants from your finger but it will help if you use it every time. This is why it is CRITICAL to ensure you have CLEAN hands and you should also clean your remotes, keyboards, mouse, phone, keys, door knobs, refrigerator handles, toilet and faucet handles, writing implements, light switches, cup handles, wallet, and your glucose monitor and test apparatus to remove any possible transferred contaminants you might have inadvertently contaminated from something you ate or drank. It will also help avoid bacteria. Especially when you eat while watching TV or your computer, phone, etc., or in your car. It doesn’t take much. A grape, a sandwich, your beverage, a handle or knob or phone someone else handled, etc. You can even cross contaminate just touching your own face or scratching your neck, etc. It only takes one mistake injecting too much insulin to kill you. So make sure your glucose tests are accurate by having clean hands and avoiding cross contamination. It would be a good idea to keep something sweet available in your home, car, pockets or purse for emergency in case your blood sugar drops too low. So when you clean your hands, do your glucose test before you touch anything else and make sure your test apparatus is also clean. I use the alcohol swabs to clean the apparatus but I also make sure it is safe to use alcohol on it first before using alcohol on anything. Alcohol can damage some products. When testing your fingers, use the outer edge of the corners of your finger rather than the top center. Just go outward from the center which is less painful. You can adjust the depth of the lancet to the least necessary to obtain blood. Although the type of monitor I use can also use blood from your forearm, if you take betablocker blood pressure medicine, it can severely impair the circulation in your arms and legs. Even at the full puncture depth, all I could get on my forearms was a hole with no blood after years of taking betablockers. I made changes to my medicines after that but then it caused arrhythmias which required another alteration of medicines again. There are also different ways of testing your glucose levels depending on your doctor and your type of diabetes and your particular problems. I can only tell you about the way I do it as an example. My doctor has me test my glucose 2 hours after a meal and to use 1 unit of fast acting insulin for every 50 points above 150. So, if my glucose is at least 150, then I use one unit of novolog fast acting insulin. If it is 200 then I use 2 units. 250 would be 3 units, etc. Some doctors have their patients test their blood before eating and estimate how much glucose will be produced by their meal and thus they take the insulin before they eat. There are also different types of insulin and how fast they drop your glucose levels. The doctors probably wont like my comment on this and perhaps there is a reason why this advanced insulin calculation method prior to a meal might be preferable for some patients, but quite frankly, I think this method is crazy & dangerous. If the patient does not accurately calculate how much glucose they are planning to eat or the amount of insulin they need, there is extreme danger of taking too much insulin and going into insulin shock and dying from glucose levels going too low. Just using vinegar in your meal can significantly lower the glucose produced and cause the insulin calculations to erroneously drop the blood glucose levels too low. Even in the hospital, the nurses test the blood and inject the insulin before you eat your meal despite the fact that they have no idea how much or which items I plan to eat. I was told that blood glucose levels should not drop below 70. In my case, 1 unit of fast acting insulin drops my glucose levels by 50 points. So it would be very dangerous to make a mistake on how much insulin you need in advance, based on how much glucose you are planning to eat. One mistake could be fatal. I much prefer the method of checking the blood glucose levels 2 hours after the meal and taking the correct amount of insulin to reduce the glucose levels. That method also reduces the chances of mistakes. Because my glucose levels are artificially elevated due to taking cortisone (prednisone), I rarely need more than one unit. Without cortisone, my glucose levels are normal, below 100 and often just 78. But I have adrenal insufficiency and fibromyalgia and crohn’s which all require cortisone, otherwise I suffer horrific pains. I’ve been on cortisone for over 5 years. Anytime I don’t take the cortisone I need, I go into adrenal cortisol crisis which is fatal. So I can only try to keep my cortisone levels as low as possible. I use a freestyle Freedom lite glucose monitor which is very sensitive to the smallest amount of blood and can be used elsewhere than just the fingers. No one told me how to use the strips so I was doing it wrong. I was trying to wipe the blood on the strip. The test strips have a tiny point on each side of the strip. Touch the point to the blood and it will soak up the blood and the unit will beep. Also, Keep a spare battery for the monitor on hand in case you need it. The doctor should also monitor your A1 levels as well as CBC, CMP, plus your kidney, pancreas and liver panels on your blood tests. I have covered most of these issues in my article on “Insulin” on this same page. There are different types of insulin and they all seem to contain phenol or m-cresol or metacresol which are other names for phenol which is a toxin used as a preservative which I do not believe should be injected into your body. Phenol is the main ingredient in Lysol. It is also used in some topicals but I don’t believe it should be injected or ingested. It is also tied to liver damage and death in cats. That should tell you something about phenol. The reason I had chosen insulin is because of the constant TV ads from Lawyers regarding dozens of different diabetes drugs to control blood sugar or insulin levels causing pancreatic cancers. Dozens of these drugs over the past 20 years have been associated with these deadly cancers. It seems the only way to survive is to lower our blood glucose levels by controlling our diets. Read my Insulin article on this same page and the following link to an article about insulin associated cancers and heart attacks. If you have a Novolog pen injection system (it may also apply to other brands), you should ALWAYS REMOVE THE NEEDLE TIP AFTER EVERY USE. If you do not remove the needle tip, even one time, it will continue to seep and leak the insulin fluid. I made this mistake just one time. I had capped the needle and thought I removed it, but only the cap came off and I did not notice the needle was still attached. Over 50 units leaked from the pen which I did not notice. I did notice the cap was wet with a strong phenol smell. However, the plunger had sank with the loss of the 50 units but the screw inside which controls the units dispensed, did not adjust with the loss of the leaked insulin. It was separated from the plunger. So when I was dialing the pen to dispense 1 or 2 units of insulin, I was not getting anything in the injection and did not notice it until my glucose levels were shockingly high even after a second injection the next time I ate. I then saw the screw inside was not touching the plunger. I dialed a couple units and pressed the button to inject while in the air and it produced nothing. I realized I had not been getting any insulin with the shots. I had to keep dialing and pressing the button with the needle in the air (NOT in me) until the screw finally came into contact with the plunger and was once again producing insulin. Over 50 units had been lost. I am very careful about removing the needle tip each time, but just one miss was enough. I did not have my glasses on and did not notice the needle tip did not come off with the cap. So it seeped 50 units. I was lucky I noticed I was not getting the insulin and was able to fix the screw separation. This is a caution to let you know you cannot forget to remove the needle tip even one time. It is why it is imperative to see a tiny drip of insulin appear on the needle point before you dial to inject. That tells you the screw is in contact with the plunger. You can also see the screw through the glass viewing windows on the side of the pen. Read the instructions. Ask your pharmacist, doctor or the manufacturer if your pen is not working correctly or if the screw is not in contact with the plunger or not appropriately producing a drip on the tip as described in the instructions. I place the used needles, lancets & strips in empty prescription bottles to ensure no one gets accidentally injured by the used items. These also have safety caps on them as well. Even though some insulins may say it can tolerate room temperature, always keep the insulin refrigerated. Do not take any chances. Cortisones can artificially increase blood sugar levels. No one told me this. So I’m sharing what I’ve learned so others don’t have to learn the hard way as I did. I’ve been on cortisones for 5 years. In my case, I only recently learned the prednisone I take for Fibromyalgia, Crohn’s & adrenal insufficiency has raised my blood sugar levels enough to require insulin the last 5 months. In trying to lower those blood sugar levels by reducing my cortisone, it causes a cortisol adrenal crisis withdrawal due to adrenal insufficiency which is fatal. I finally got it low enough to only need insulin once every few days but caused an adrenal crisis & had to increase the prednisone again. I chose insulin because the pills to control glucose or insulin levels always seem to cause Pancreatic Cancer. Then I learned Insulin contains phenol & has a high incidence of cancer & heart attacks within 3.3 years of use, which is why I was endeavoring to lower my prednisone to lower my need for insulin. Read my article on Insulin on this page for more info and the article on the link below. Sugar in the blood acts like crushed glass in your body & destroys organs like kidneys, damages blood cells causing clots & impairs circulation & peripheral nerves leading to organ failure & Amputations. When the doctors kept telling me my triglycerides were too high, I didn’t understand the danger because I had normal glucose and normal cholesterol levels at the time. Not one of my doctors told me the sugar was acting like crushed glass. I knew cholesterol and plaque was like that but I did not know about sugar being like that. So I am making sure you know about this as well. Having seen a damaged kidney versus a healthy one and a diabetic with Amputations it made me realize the seriousness of controlled sugar levels. I think Halloween candy and trick or treating should be eliminated. Just have costume parties. Also, soda pop is a primary source of damage due to the corn syrup or sugars. Just remember, it is like eating or drinking crushed glass whenever you eat candy or drink soda pop. What is worse for me is that I am deathly allergic to artificial sweeteners like aspartame and saccharine. I can only tolerate Truvia (Stevia) which needs a tiny amount of sugar to make it taste right. We need to educate our children when they are young and teach them proper diet. It is important to show them why it is imperative. I wish I had known these things when my child was young. It doesn’t make any impression upon someone unless they know the specific reasons of the bad effects from what they are doing. It is not enough to just say they need to watch their diet or keep glucose levels down. The terms exercise and lose weight have been said so many times that no one hears them anymore. It is not enough. They need to know the consequences from an early age. There was an Oprah Winfrey episode I saw repeated as a rerun a few months ago where a doctor showed the damage to the kidneys and interviewed a diabetic who lost her legs and arm to diabetes. That show will most certainly leave a lasting effect and scare you into taking these issues seriously. It also let us know that taking a 30 minute walk each day will help your body produce insulin. It also said that belly fat interferes with your body’s ability to produce insulin. Or how vinegar on any food will break down the sugar. I had never heard these specific issues before except on this one show. 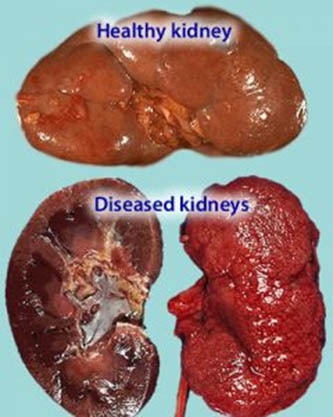 Here is an image of kidneys damaged by diabetes. Posted in Blood Clots, Diabetes, Headaches, Health, Injections, Insulin, Medical, Toxins, Uncategorized. I started using Insulin about 4 years ago. I was quite distressed to see the insulin contained Phenol which is a highly toxic chemical used as a disinfectant in products like Lysol. The same ingredient that caused liver damage and death in house cats and other pets where Lysol was sprayed. I instantly recognized the smell of phenol in the insulin which is quite strong in the insulin. I immediately started looking for another insulin without phenol. To my horror, there are none. In some insulin brands, they list the phenol as m-cresol or metacresol… which is simply another name for phenol. There is a pharmaceutical company in Denmark which holds patents on more than one patent insulin without phenol. I did finally find an insulin which I am not allergic to. HumulinR. It is made from humans. All the others were made from animals and I was allergic to them. When I was on Metformin, a diabetes pill, my kidney GFR levels dropped to 31. You need a transplant at 29. I got suspicious and I stopped the Metformin. Just one week later, my GFR levels rose to 96. But a year later the insulin alone wasn’t enough so I occasionally alternated with Metformin. My GFR was 53 doing that but it helped with the issue. Prior to this, my glucose levels were so high without insulin or metformin while only taking glimepiride, the glucose meter was unable to read it. That meant my levels exceeded 500. I had one hospital tell me it was 850. My legs had started collapsing out from under me… all of a sudden without warning, like the bones had turned into a sack of rocks. They just crumpled. My legs could not support me. It was quite unnerving. The doctors couldn’t figure out what to do because the insulin they were using actually increased my blood sugar by 100 points. 5 months later, I became suspicious about the animal sources of insulin and the emergency room heeded my suggestion & tried the HumulinR from humans and that fixed the problem. Over a dozen doctors failed to figure this out, among other things. You sometimes have to do research to figure out what the problems are. Clearly, the current generation of doctors are becoming less and less helpful… and most are imported by the hospitals. The very reason I originally chose insulin over pill treatments to control glucose or insulin levels was due to the numbers of ads I have seen on TV for “If you or your loved one was taking xxxxx drug for diabetes and developed Pancreatic cancer, please contact our Law firm, etc.” Dozens and dozens of these diabetes drugs over the last 20 years all seem to end up on some TV lawsuit ad for causing pancreatic cancer. I have an excellent memory. The sheer numbers of diabetes drugs associated with pancreatic cancer are quite disturbing. This is one way to reduce Medicare and medical insurance companies costs and reduce government expenses as well as population levels. Get rid of the infirmed. One other item I have noticed is the connection between corn products and diabetes. Those races and ethnic groups with the highest incidences of diabetes seem to be linked to high amounts of corn in their diets… such as native American and Hispanic. Both are high in diabetes. Those groups lowest on corn consumption, seem to also be lowest on diabetes. As I previously mentioned, I notice patterns. This was a pattern I noticed. Here is diabetes percentage by country. You will see the highest corn consumption countries on top and the lowest on the bottom. Thus, I never eat corn or foods which contain corn, corn starch or corn syrup. Which means no prepackaged or fast foods. I do the same with soy products. Read the ingredients on everything you buy for corn or soy. Soy is bad for other reasons. Incidentally, GMO Corn and Soy now controls about 90% of the US & Canadian market. Everything that company touches seems to be toxic. See my article on IBS (Irritable Bowel Syndrome) and bGH bovine (cow) hormones given to dairy cows to increase milk production from the same company. Also read about “round up ready” products online where the farmers spray their GMO crops with Roundup weed killer just a day or 2 prior to harvest… and how they try to convince consumers that it is perfectly harmless to consume round up in their foods. The state of NY sued them for claiming it was as safe as table salt. Frankly, I think we need to boycott everything they produce. Here is an article about roundup products you should read. I realize that most people don’t have a choice on some of these medicines, but this is something which we all need to be aware. I had a choice. It isn’t very pleasant, but at least it was a choice. The key to fixing a problem is to first be aware that there is a problem. I am not a doctor. I am an engineer so I can only relay from my personal experience. Please see a doctor or hospital if you need medical advice or treatment.